It’s something every business strives for. Whether you’re a B2B or B2C company, there’s a certain type of person who can really take your business to the next level. 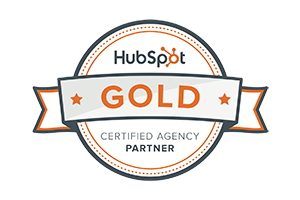 Not only can she boost your MRR, she can also be the difference between one and five new clients. She is the brand advocate. Brand advocates are any company’s favorite type of customer. 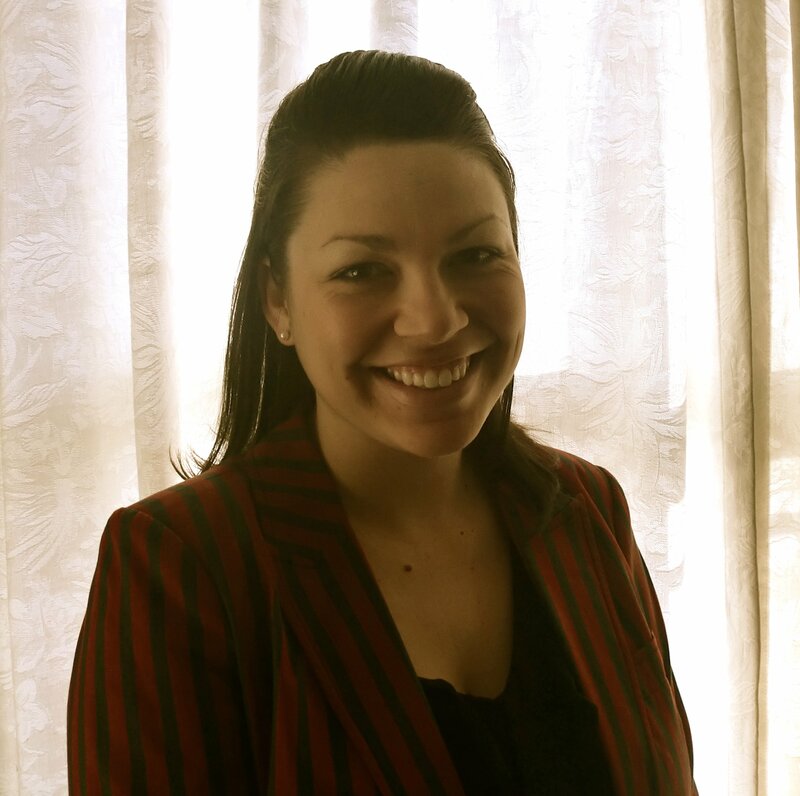 Not only are they paying customers, they use your product or service a lot and they love it. In fact, they love it so much that they talk about it on a regular basis. Even if a particular advocate doesn’t have the biggest audience, there are still people in his or her audience who are listening and getting to know your brand through their peer’s advocacy. 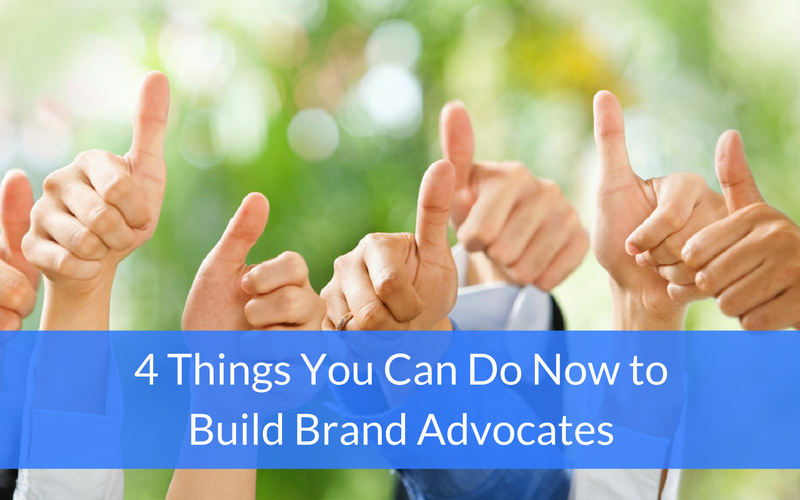 Let’s take a look at a few examples of brand advocacy from around the web and then explore how you can begin to build brand advocates yourself! First, it’s important to understand the difference between advocates and followers. 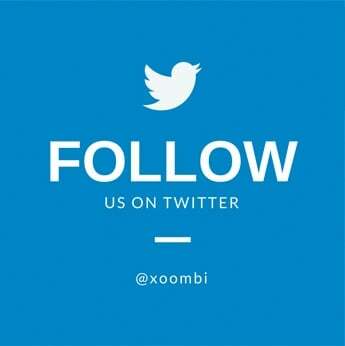 According to statistics from Ogilvy & Mather’s social branch, while 84% of social media users like or follow a brand or product, only 19% of users actively recommend brands to other users. 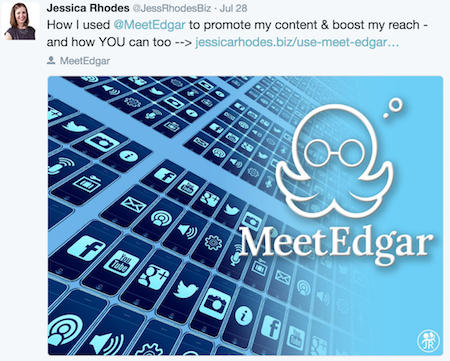 A post on Twitter from a founder and podcast host advocating for social media marketing platform MeetEdgar. 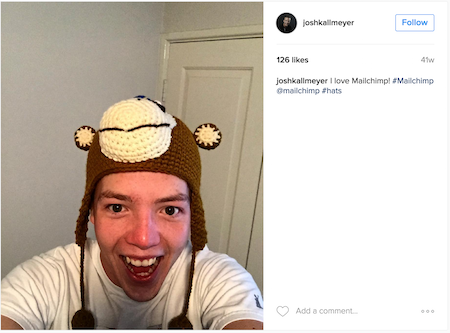 An Instagram photo from an email marketer promoting MailChimp. 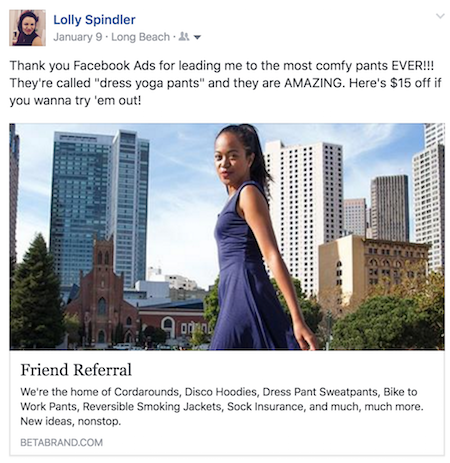 A Facebook post I wrote after discovering the amazing Dress Pant Yoga Pants from Betabrand. By now you probably see the value in brand advocacy and want to know how to go about building brand advocates yourself. 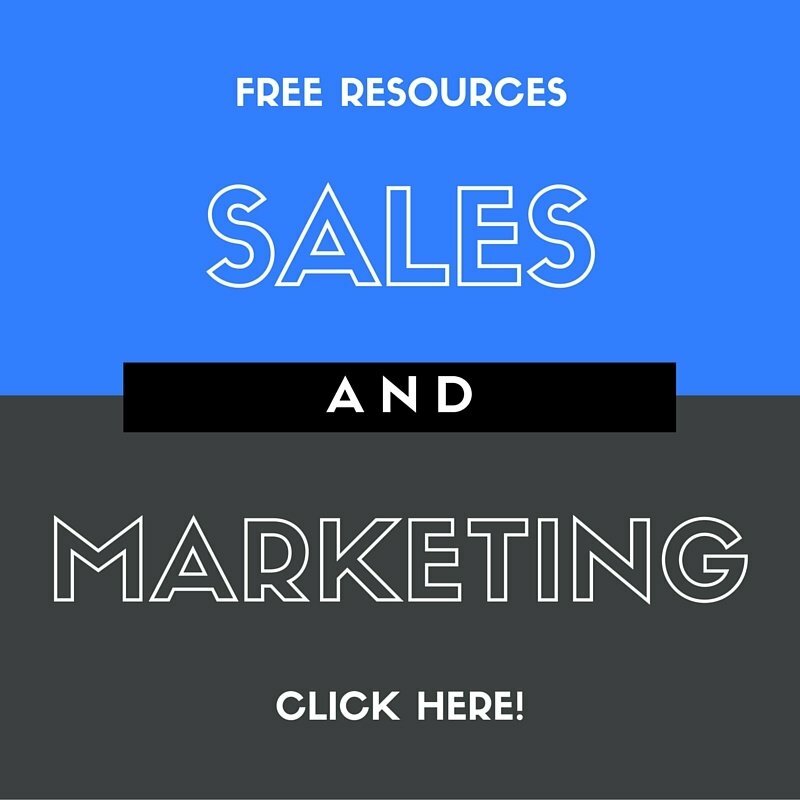 Here are some ways you can turn valued customers into valuable marketing assets. You have a lot to gain from providing great customer service, and a lot to lose by providing poor service. Don’t just meet your customers’ expectations; exceed them. A good rule of thumb is to under promise and over deliver. Not only will asking for and implementing customer feedback help you deliver better customer service, it can also give you valuable insight into your business. You’ll get to know what’s working and what isn’t from your product or service’s end user, let your customers know you actually care about what they think, and—moreover—you want to improve what you offer them. If you’re continuously providing great service and asking for and implementing feedback, you’ll have more potential advocates than the average business. The next step is to see which customers are most likely to actually promote your product or service. You can do this by sending out a simple email to current customers asking them how likely they are to recommend your business (to family, friends or colleagues) on a scale of 1-10. Those who respond with 9s or 10s are your potential advocates. You can reward your advocates with loyalty programs, referral programs and/or freebies. Loyalty Programs: These can be points based (think Starbucks) or fee based (think Amazon Prime), but should offer something your customers want. Referral Programs: Give your customers an incentive to share your product or service by rewarding them with a discount or points in your loyalty program. Freebies: Whether a free t-shirt of a handwritten thank you note, these little tokens can generate a deeper sense of loyalty to your business. 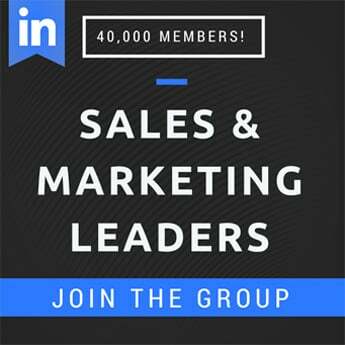 They boost MRR: According to Zuberance, advocates spend at least twice as much as the average customer. They act as their own sales force: Advocates go out of their way to recommend their favorite products and services, doing a lot of ground work for you. Honestly, by being good to the customers you currently have, you can easily create advocates for your business. Not only meeting, but exceeding their needs is the first step!